(CNN) -- World champion Valentino Rossi has taken the lead in the overall MotoGP standings after claiming his first victory of the season in the Spanish Grand Prix at Jerez. Rossi has now taken the lead in the MotoGP standings after victory in the Spanish Grand Prix at Jerez. 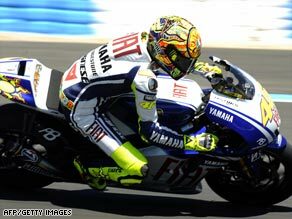 Italian Rossi is now 11 points clear of 2007 champion Casey Stoner, who finished third on Sunday, after securing the 98th race win of a remarkable career. Spaniard Dani Pedrosa, on a Honda, finished second ahead of Australian Stoner, on a Ducati. The result gives Yamaha rider Rossi 65 points with Stoner, who won the season-opening race in Qatar, on 54 points. Jorge Lorenzo, the winner last time out in Japan, is third on 41 points, with Spaniard Dani Pedrosa in fourth place with the same tally. Starting fourth on the grid behind Spanish team-mate Lorenzo, Pedrosa and Stoner, Rossi overtook the Australian on the sixth of the race's 27 laps before chipping away at Pedrosa's lead. Pedrosa had led for the first 17 laps of the 4.423km circuit but on the 18th he could only watch as Rossi slipped past him and into the lead. Meanwhile, Lorenzo crashed with three laps to go, dropping precious points in the race for the championship title.